The honey-coloured exterior is somewhat misleading. 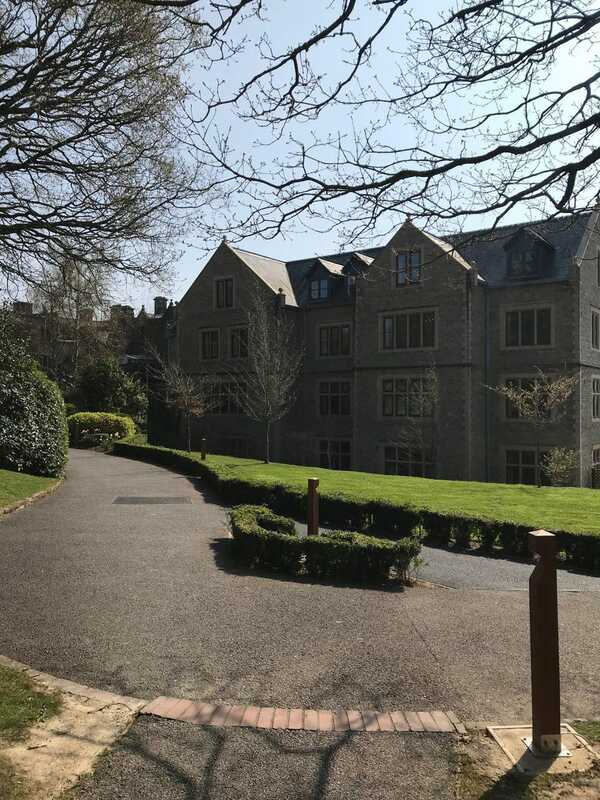 Bordering Sussex’s idyllic South Downs, South Lodge – a 19th century neo-Jacobean manor – is (on first sight) exactly what you’d expect. There are manicured lawns, wooded walkways and a Wisteria covered entrance. Step inside and there’s enough ornate ceilings, wood panelling and overstuffed sofas to keep any Victoriana fiend happy. The traditional exterior of South Lodge belies its new opening. As gorgeous and comforting as this all is, it’s also fairly standard for a traditional English country-house hotel. There are creaking floorboards, floral wallpaper in the bedrooms and dreamy views – indeed, everything that any guest loves about country house living. 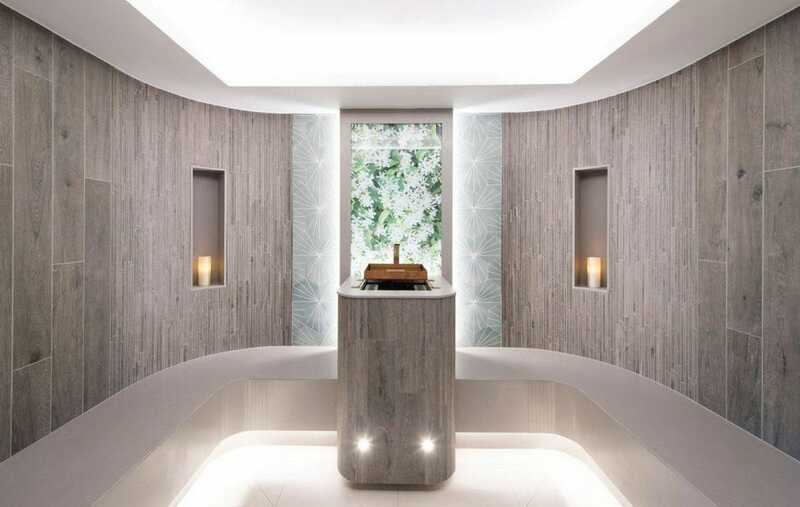 But, wander along the ground floor corridor, and you’ll spot the hotel’s trump card – a brand-new, cutting-edge £14 million spa, hidden behind the traditional façade. 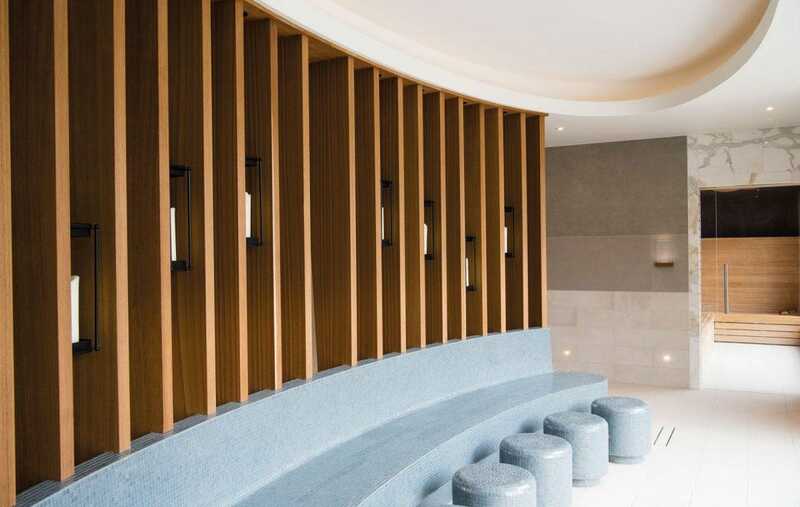 Bringing South Lodge’s offering bang-up-to-date for a contemporary customer, The Spa, which is a sprawling affair – stretching across 44,000 sq ft, boasts an architecturally sleek appearance, designed by Felce & Guy Partnership. Green oak cladding, a grass and sedum roof, terraces that segue inside-out and flashes of anthracite metal are juxtaposed with acres of glass. The result is a light and airy feel throughout the multi-levels. The thermal suite at The Spa. There are three pools in total – an extravagant touch for a hotel spa. One is an indoor infinity pool, which, at 22m, is large enough for serious swimmers. While, outside, there is a ‘straight-out-of Miami’ scenic, outdoor vitality pool – with waterfall, body jets and massage water beds. And relax… the stylish decor of the spa is a mood enhancer. 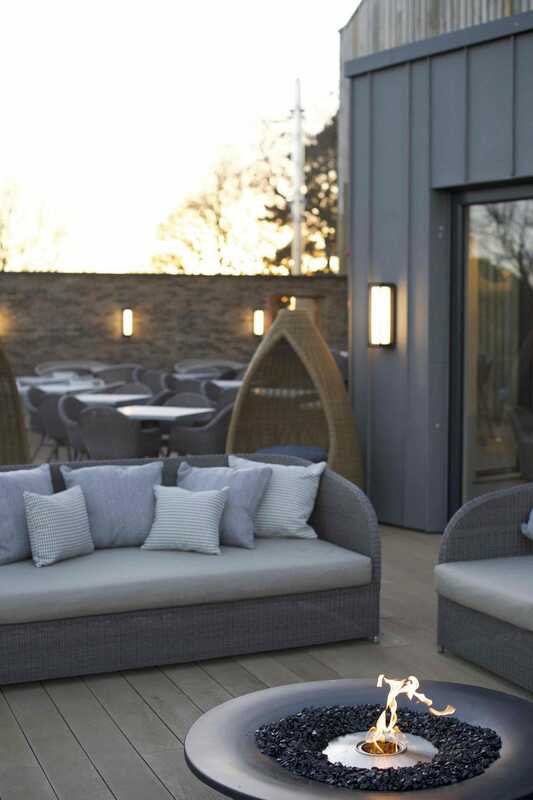 At a lower level is South Lodge’s pièce de resistance – an outdoor, heated natural swim pond, which is the first of its kind in the UK, and which is filtered by aquatic plants. Nature and the outside-in aesthetic is captured beautifully by interior designers Sparc Studio. 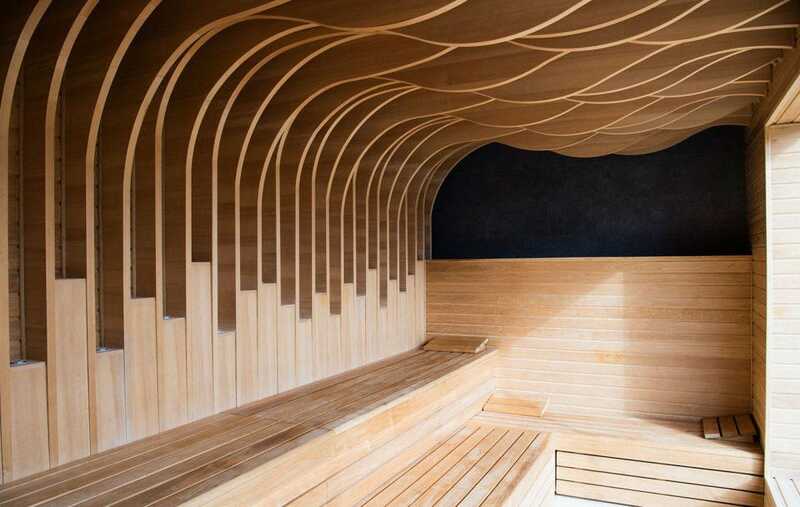 From the curvy rattan cocoon pods to the varnished ‘tree-trunk’ tables, from the fire-pit to the mesmerising, wooden ripple-effect ceiling in the sauna – inspiration was garnered from the rolling South Downs landscape. The outside-in ethos gives a Miami feel. An eco-awareness is also at the forefront of the design with a biomass boiler used for power and a reed bed for sewage treatment. Furthermore, echoing both these aspects is the spa’s dedicated restaurant Botanica, which is found adjacent to the spa reception. Botanica has a focus on nature. 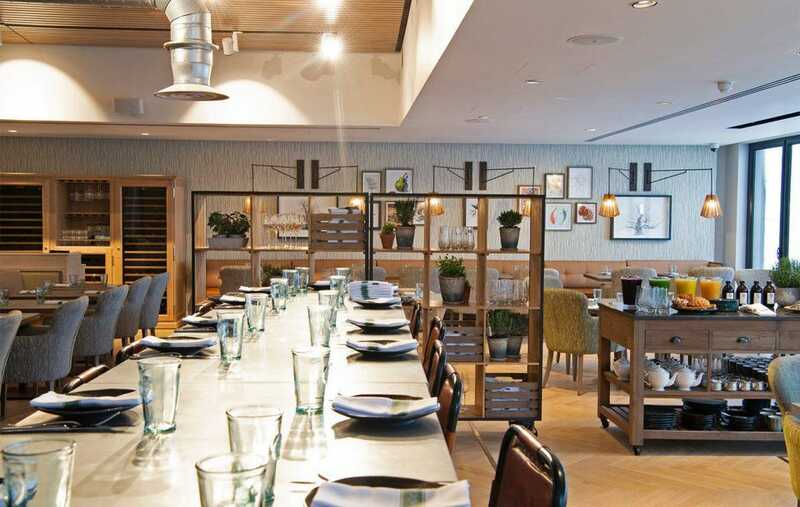 With a focus on sustainability, the Mediterranean inspired eaterie – spearheaded by head chef Jonathan Spiers – features dishes such as the ‘wasted’ burger, to indicate a minimal waste philosophy (it is, in fact, made from surplus vegetable). Locality and vegetable dishes are also at its heart, with standouts including the all-day brunch (‘English chorizo, house baked beans, sourdough toast and a South Lodge hen’s egg’) and the ‘truffle and artichoke tortellini, Twineham Grange cheese and Kent rapeseed oil’. Desserts are also well-thought out – and land on the right side of healthy. A must is the ‘poached pear and ginger beer gelato’ and a range of ‘small bites’ including ‘lavender shortbread’ and ‘courgette and polenta cake’. Inside, you can spend hours padding between the herbal infused sauna, a marble salt-steam room and the jasmine-scented steam room. There’s also an ice-cold ‘drenching bucket’ to add a Scandi dimension to proceedings. 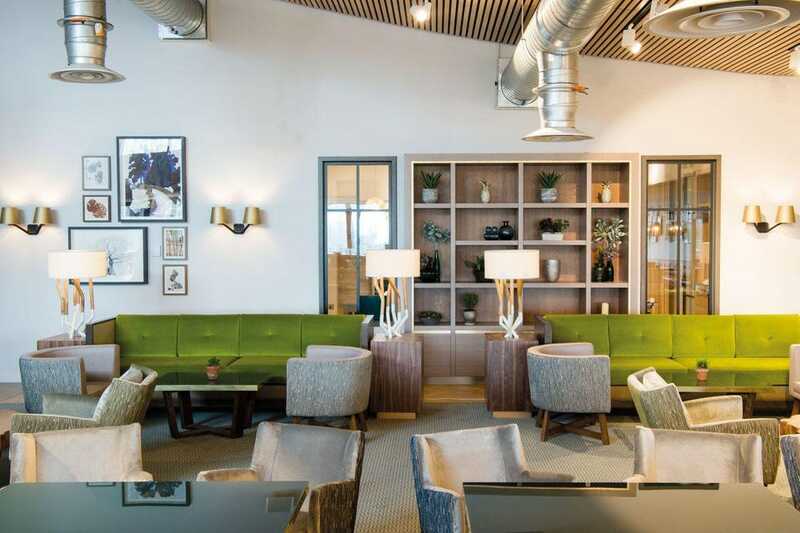 The lounge area in Botanica. Across the 14 treatment rooms – all themed around nature – you can indulge in therapies by The Spa or Omorovicza. The treatment menu is huge – with a 50-strong choice on offer – with the Omorovicza Botanical – a pampering body scrub, massage and facial using botanicals of sage, chamomile, calendula and jojoba– exclusive to the hotel. In fact, there are lots of ‘one offs’ that make the spa so special: from the relaxing lounge with its state-of-the-art sensory experiential beds to the dedicated mud room. There’s also a Grizzly’s Barbers for men and a Ridgeway Beauty Bar, which is a real gem. While you enjoy your pedicure or manicure, you can have a glass of Ridgeway sparkling wine via the UK’s only sparkling wine Enoflute dispenser to perfectly serve the bubbles. The dining room at Camellia. While you can finish your experience with a plant-based plate at Botanica, it would be a shame not to take advantage of the culinary prowess that South Lodge, part of Exclusive Hotels, is renowned for. The tasting menu at The Pass, for instance, is a must for those celebrating a special occasion, but the Camellia restaurant also doesn’t disappoint. 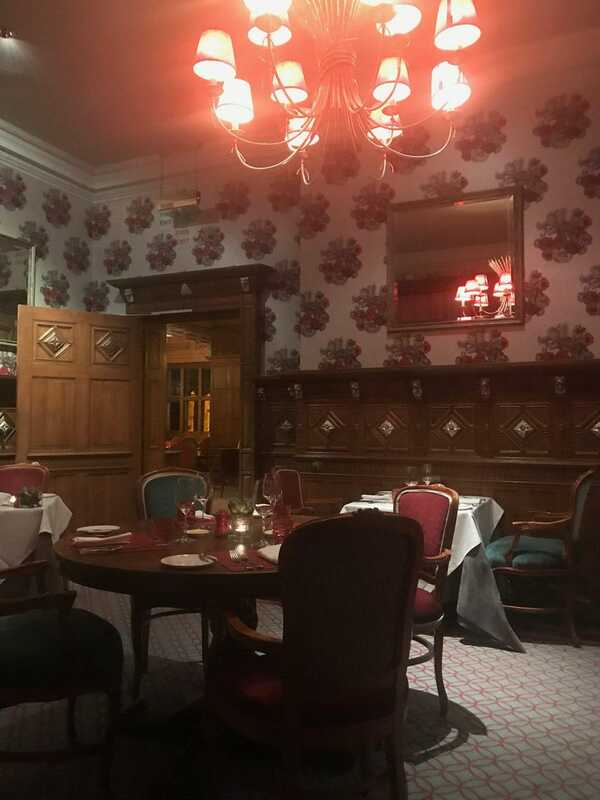 The two-AA rosette restaurant marries a traditional ethos with a hip take on period décor (original wood panelling is juxtaposed with walls wallpapered in vibrant blooms and a carpet with a funky geometric design). The menu is a delight with produce sourced from the walled kitchen garden and focusing on seasonality. The ‘Egg’ starter – ‘slow-poached egg, asparagus, sourdough croutons and wild garlic salsa verde’ – bursts with flavour, while the ‘Plaice’ main course – ‘fillet of Plaice, dulse, breakfast radish, pickled cockles and caviar butter sauce’ – is refined and elegant. For dessert, ‘Berries, Vanilla and Cream’ is a fun and multi-layered take on what sounds like a simple dish – with white chocolate cream, red sable, raspberry and lime sorbet and vanilla ice cream, a complex match made in heaven. Work off that dessert in the gym. 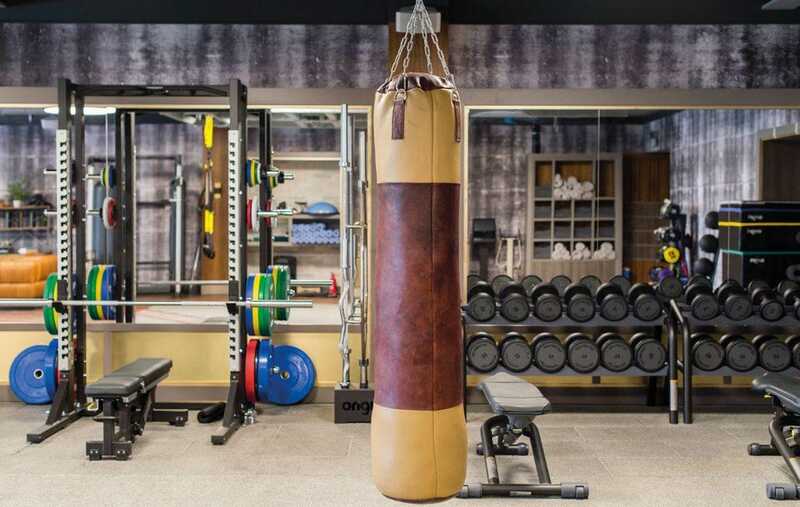 Decadent and indulgent it may be, but at least there’s a brand new sprawling gym to work it off the morning after – whether you choose the TRX rig or a class in the spin studio, it would be naughty not to.